Michigan is among the U.S. states that are practically synonymous to harsh winters. This year seems to be no different. For this reason, it is recommended that locals have their roofs inspected to spot problems early on and prevent those problems from becoming worse once winter reaches its peak. 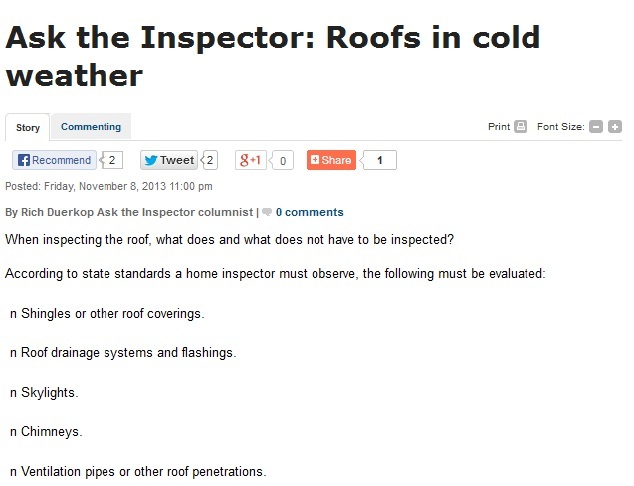 In an article for Leader-Telegram, Rich Duerkop explains how a home inspector performs a roofing inspection. 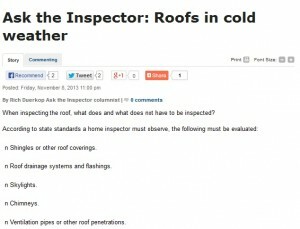 When inspecting the roof, what does and what does not have to be inspected? Shingles or other roof coverings. Roof drainage systems and flashings. Ventilation pipes or other roof penetrations. Any signs of leaking or abnormal condensation. A home inspector also must describe how they made those observations – either by walking on the roof, from a ladder or by spotting them from the ground. But conversely, an inspector is not required to walk on a roof or evaluate the condition of accessory equipment including solar panels, antennas or lightening rods. The home inspector also does not have to inspect an internal gutter and downspout system or any underground drainage systems. A home inspector’s report, though, may not tell the whole story. Normally, home inspectors are called upon when homeowners decide to put their property up for sale. A home inspector is expected to assess the general condition of the home, not necessarily to see what the roof needs in terms of repair or replacement. If homeowners want their roof assessed for damages, particularly before winter strikes, they will benefit more from hiring trusted roofing companies in Michigan to do the job. Unlike a professional roofer, a home inspector typically will not have the necessary training and equipment to climb roofs and conduct a thorough examination. Thus, it is highly likely that they could overlook a number of damages. In fact, according to an article in MSN.com, home inspectors commonly miss a roof leak, a problem that can greatly compromise the roof’s condition if not immediately repaired. Michigan’s winters can bring extreme weather conditions that may badly affect roofing. Hence, before the season starts, it would be a good idea to call on a reliable Detroit roofing company like Kroll Construction to do a thorough roof inspection. This way, the roof’s condition can be better assessed, and the necessary measures may be undertaken to prepare the roof for the winter.